“I attribute what I am to influential people like her. She’s a HERO to me.” stated the email from a former sponsored child, looking to thank his sponsor. When we received it, we knew we had to share Jovan’s story with you, generous child sponsors and Everyday Heroes who make lives like his (and his mother’s) possible. We contacted Jovan – now a systems developer in Kampala, Uganda – and asked him to tell you his story directly. Here it is, in his own words. 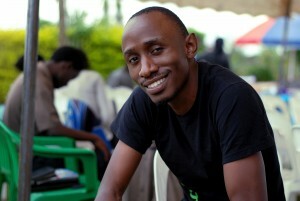 “In a humble village of Busega in the suburbs of Kampala resided me and my family. We had moved there in 1992 when I was just three years old. Hardly a year after we had moved there, in May 1993, my dad passed on. Having been the family’s breadwinner, my dad’s death marked the beginning of a chapter of struggle in the family. I and my four siblings stayed with our mum, and I have since lost my big brother in the July 2010 Kampala bombings. We did some farming in the backyard and this became our source of food. My mum later received a calf through one of Canadian Feed The Children’s (CFTC) programs that was looking out for widows and over time after it grew into a cow and eventually gave birth. It became our major source of income mainly through the selling of milk. 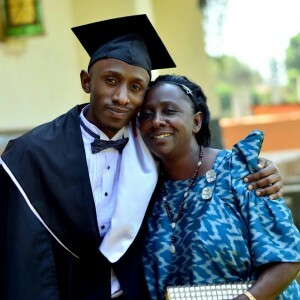 Before sponsorship, our major challenge was finances as my mother didn’t have any formal job. Access to essential needs was a real struggle. My mum was really determined to see all her children get an education but it was never easy. We always defaulted on school fees and on a number of occasions, the school would send us back home because of this. Acquisition of scholastic materials like books, pens, and uniforms was also a tug of war. 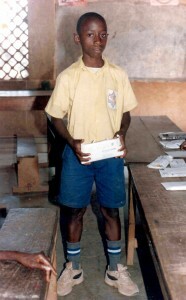 The sponsorship was covering part of my fees dues, scholastic materials and school uniform. As a result, I was also able to enjoy some of the benefits that children from well-off families enjoyed and the rate of fees defaulting greatly reduced. School became fun and enjoyable. This sponsorship was a big stepping stone for me to get where I am today and I’m forever grateful. When I had just joined the program around 1997, I didn’t know I had a sponsor. When I learned that someone I didn’t know and had never met cared about my education, it changed the way I looked at education. I realized how valuable education was and this was reason enough for me to study hard. I did my primary education at Kabaale Busega Primary School [graduating from Grade 7] in 2002. I joined St. Henry’s College Kitovu in 2003 and completed my O level in 2006. In 2007, I joined Mengo Senior School and completed my A Level in 2008. I later joined Makerere University in 2009 from where I graduated with a BSc. Software Engineering in 2014. When I joined secondary school, the CFTC sponsorship only covered a small fraction of my school fees*, after which families were helped to start some projects like piggery and poultry. It was quite challenging but mum really fought hard. Besides the cow, she had now ventured into small scale poultry farming and piggery. From these together with the support from some family members, she managed to pay our school fees. When I joined university, it became harder for mum to raise my tuition fees as it was six times what I used to pay in high school. This was worsened by the death of my big brother because he had completed university and had started rendering some support. However in my second year, I [received a local scholarship award] which covered my tuition fees until I finished. As a Systems Developer, my work involves reading and understanding user requirements, designing and developing software systems that meet these requirements, deploying, testing and maintaining systems as well as writing reports such as installation reports. What I enjoy most about my job is that it’s about problem solving. I solve people’s issues and make their work easier by writing code. Most notable was a World Vision system on which I was lead developer. As a person with great love for children, working on this important project was a prodigious opportunity. I would love people who are considering being a Canadian Feed The Children donor to know that their support, no matter how small it may seem, is causing a great positive difference in lives of many children out there.